Cricketer-turned-politician Imran Khan was elected Pakistan's 22nd Prime Minister by the country's National Assembly on Friday, three weeks after his Pakistan Tehreek-e-Insaf (PTI) party won the highest number of seats in the general election. The PTI chairman will be sworn in as Prime Minister on Saturday by President Mamnoon Hussain. 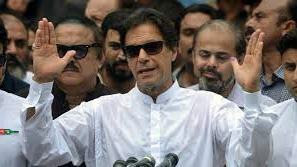 The announcement of Khan’s election came amid protests from opposition lawmakers who shouted slogans denouncing alleged electoral fraud during the July 25 election. Addressing the house amid a ruckus by PML-N members and cheering by PTI legislators, a charged Khan said: “I promise my nation today that we will bring the tabdeeli (change) that this nation was starving for. “I did not climb on any dictator’s shoulders; I reached this place after struggling for 22 years. Only one leader struggled more than me and that was my hero, Jinnah. The Pakistan People’s Party (PPP), the third largest party in the house that joined the PML-N and others in an opposition alliance, withdrew its support for Shehbaz Sharif’s candidature as Premier, days before the election and abstained from voting, Dawn online reported. Geo News cited sources as saying that Khan has also decided to change the heads of the Federal Board of Revenue, Railways, Pakistan International Airlines and a few other institutions.